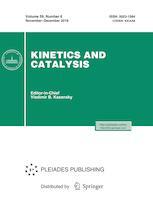 Kinetics and Catalysis Russian is a periodical that publishes theoretical and experimental works on homogeneous and heterogeneous kinetics and catalysis. Other topics include the mechanism and kinetics of noncatalytic processes in gaseous, liquid, and solid phases, quantum chemical calculations in kinetics and catalysis, methods of studying catalytic processes and catalysts, the chemistry of catalysts and adsorbent surfaces, the structure and physicochemical properties of catalysts, preparation and poisoning of catalysts, macrokinetics, and computer simulations in catalysis. The journal also publishes review articles on contemporary problems in kinetics and catalysis. The journal welcomes manuscripts from all countries in the English or Russian language. Kinetics and Catalysis is a peer reviewed journal. We use a single blind peer review format. Our team of reviewers includes over 160 reviewers, both internal and external (85%). The average period from submission to first decision in 2017 was 66 days. The rejection rate for submitted manuscripts in 2017 was 25%. The final decision on the acceptance of an article for publication is made by the Editorial Board.